Often constraints help you more than they stop you. Like in this photo, for example; since I cannot show children without authorization on this blog, I looked for an angle where I could take a shot of this small amusement park without showing any children faces! 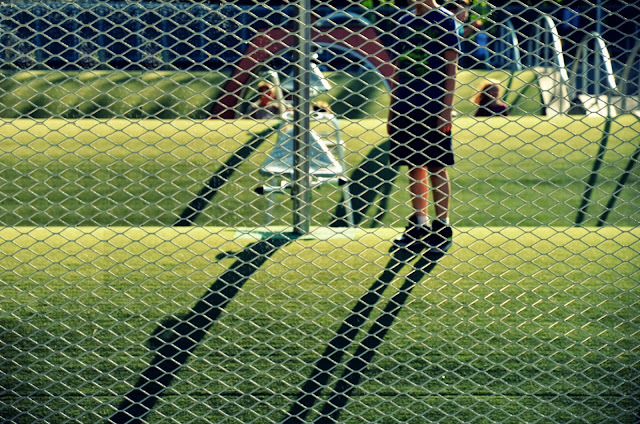 In the end, I kinda like the result, because of the composition and the mix between the shadows, the color of the playground and the grid in the foreground. I love the way you took something "not allowed" and made it work for you. great shot! It is a very interesting shot. I like it a lot! This is one of those photos you have to keep looking at and when you do, you see something new. Wow ! This is a fantastic shot ! I think maybe one of your best.